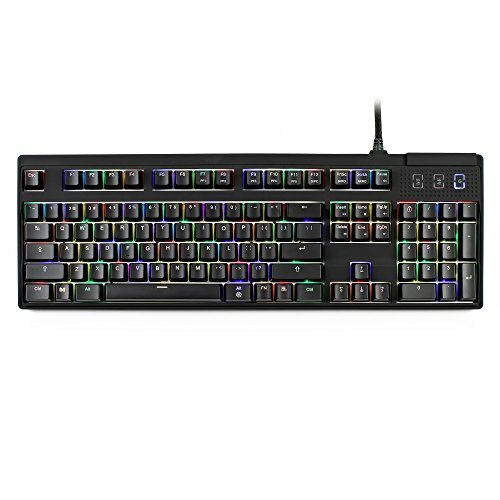 RGB backlit keys for enhanced visuals, 4 levels of LEDs brightness adjustment to suit your environment and 7 different lighting modes to give your keyboard a cool looking effect. Cherry MX RGB Brown mechanical key switches (Tactile), It operates with an actuation point of 2mm and only requires a pressure of 45g for the key to register a key stroke Furthermore, the actuation point and release point of the switch are identical, which will facilitate speed, precision and more control in typing and less fatigue to your fingers. Braided Cables & Gold Plated Connectors Heavy duty braided cable provide additional flexibility and prevent tangle wired. 18K gold-electroplated connectors to minimize latency and provide reliable connection that optimizes signal quality and delivers the best transmission and data transfer. Built in 2 high-speed USB 2.0 hub. Added convenience right at your finger tips. Transfer files and photos from your thumb / flash drive at 480 Mbps high speed data transfer rate and 100mA power current on each port. Ideal for small USB mobile devices such as mouse, trackball, trackpad or joystick. If you have any questions about this product by Max keyboard, contact us by completing and submitting the form below. If you are looking for a specif part number, please include it with your message.